In 2011, I was introduced to Asghar Farhadi’s superb film A Separation and his unique “everything that can go wrong, will go wrong” storytelling style. The film was a daunting, exhausting, and at-times experimental test on it’s audience that pushed the boundaries of the degree to which people can watch the lives of others quickly spiral down and out of control, in a relatable everyday setting. With his newest film The Past, Farhadi sculpts a meticulous piece of cinema that reinvents the cliched English phrase, “the past comes back to haunt you”, and instead renegotiates it’s conventions to tell a story that shows how sometimes the past can instead come back to save you. The film, which premiered at the Toronto International Film Festival in 2013 and played on the first night of screenings (although it was not the opening night film), was a big test to the skills and techniques of Farhadi’s uncompromising vision and narrative style. His Oscar winning film A Separation was regarded as one of the best films of that year, and in addition to winning the coveted Foreign Language Film top honour, Farhadi was also nominated for Best Original Screenplay, a feat that not many foreign language films reach, let alone their writer/director. Yet, Farhadi outdid himself once again with The Past; delivering a film that not only deepens the complexity of his characters and the moral dilemmas they face, but also pushes the conflicts of parents being accountable to their children, showing the selfishness of grown men and women and the daft choices they make, all in the name of love. To say that The Past is one of the most powerful, adult-driven dramatic narratives of the year, would be an understatement. Master auteur extraordinaire Farhadi delivers a film that tests the parameters of love, without ever giving us a clear-cut or wholly defined antagonist. His characters are people like you and me, dealing with life in the only ways we know how. Instead, the biggest villain in Farhadi’s film is life itself, with it’s unpredictable and sometimes diabolical sense of humour. This heavy-handed story of people caught in a twisted plot of love, adultery and confusion begins with Ahmad (Ali Mosaffa), a simple Iranian man who after four years of separation, travels to France to finalize his divorce with Marie (Bérénice Bejo). Marie has requested Ahmad’s return so that once their marriage is terminated, she will be able to marry Samir (Tahar Rahim), the owner of a laundromat and the new man in her life. Ahmad stays at Marie’s house along with her two daughters from a previous marriage, Lucie (Pauline Burlet) and Léa (Jeanne Jestin) as well as Samir’s son from his first wife, Fouad (Elyes Aguis), on the condition that while he is there, Samir stay somewhere else. Awkwardly forced to sleep in the same room as Samir’s son, Ahmad is able to make the best out of an uncomfortable situation, a trait we quickly learn defines Ahmad throughout the rest of the film. What develops then is a convoluted and highly delicate film with people who are just trying to make the best out of the situations they find themselves in. One of the beauties of a Farhadi film is its ability to show the true nature of people put in awkward and cynical situations. His men are furious, egotistical and macho in ways that allow other men to understand their own blow-ups and justify why their tempers flare. His women are strong and confident, using love as a muse to defy the limitations society has put on them. In action and in silence, his characters manoeuvre the unsteady terrain of life and the loud constraints of relationships. Throughout so many instances within the film, his characters find themselves lost for words and in a void that demands only silence. Yet within those subtle and incandescent moments of silence, the emotions of his characters are able to reach high decibels of intensity and range. One of the biggest differences between The Past and A Separation is Farhadi’s stunning ability to incorporate the perspectives and insights of the children involved in these complex relationships. Often times hysterical and warranting laughter, the film allows you time to step back and question the comedy in tragedy. At times, The Past plays out like a serious episode of Kids Say The Darnedest Things, through their perspectives, a perspective that oozes with innocence (as only a child has) is the very fabric that allows it’s audience to question the choices the characters make and the consequences they may have. The children in the film are deliberate aspirations of what the adults strive to be, even while they spew impulsive child-like behaviour that raises eyebrows constantly. Farhadi taps into this commonly misunderstood void of how the hasty actions of their parents affect the attitude and behaviour of their children, more often than not, resulting in unwanted character traits fueled by violence, anger and a desire to stand one’s ground. In addition to Farhadi’s direction and storytelling strengths, is his ability to cast spot-on actors to vividly bring to life the characters he writes. Mosaffa, an Iranian national treasure and picky actor who inhabits his role as Ahmad, is a communicative sea of calmness and reason. His ability to control the presence of other actors on screen is incomparable to anyone working in Hollywood today. Rahim (Un Prophete) on the other hand, juxtaposes Ahmad’s character by being a misunderstood, feisty thunder-storm of carelessness and thoughtless emotions. Together, the two male leads distribute an equal weight of sincerity as well as pathos in the film. Lastly, the epitome of the intensity and fine craftsmanship of acting ability in the film is Bejo (The Artist), who is nothing short of miraculous in her role as Marie. Seeking redemption in her actions and bringing a slight air of disrespect to the people most dear in her life, she is able to allow audience members to wallow in her self-induced misery and empathize in her search for individuality in a world conquered and controlled by men. 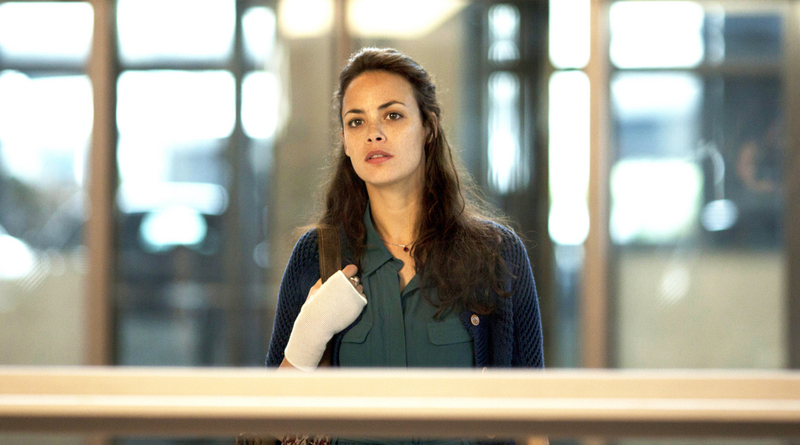 It is fair to say that Bejo delivers one of the finest performance of any actress in 2013. The Past evolves into one of the most mature and devastatingly satisfying films of 2013. Complete with real-life dilemmas, heart-wrenching moments and engraved cinematic images that will last a lifetime (including the final still frame of the film); Farhadi’s latest masterpiece is a lucid and rewardingly dreary film, showcasing one of the most comprehendible adults version of monkey-in-the-middle ever depicted on camera. Much like its final frame, stuck on a moment of pure cinematic ecstasy, confidence and allure, one thing becomes certain; The Past is a film that climaxes the bright future of one of the most adept cinematic poets chronicling the real-life world of people today. A raconteur of his time or just a highly-dramatized storyteller? Is Farhadi the next great thing to happen to foreign language films? Or is The Past an overly dramatized fictional narrative? Love the film as much as we did? Leave your thoughts, comments or quips below. This entry was posted in Reviews and tagged Ali Mosaffa, Asghar Farhadi, Bérénice Bejo, Elyes Aguis, Jeanne Jestin, Le Passé, Pauline Burlet, Tahar Rahim, The Past. Bookmark the permalink.